There’s an urge to lump Monsters University, Pixar Animation’s first prequel, in with the studio’s last stab at a sequel. But whereas Cars 2 was a lackluster, uncreative money grab, Monsters University is, well, a money grab. But it also exhumes the studio’s signature wit and charm, mothballed since 2010’s Toy Story 3. Speaking of which, Monsters University fits purposely into the timeline of Pixar’s maturing target audience that began with youngsters who discovered the hidden world of their playthings in 1995 with Toy Story. They’re also the teenagers who, 15 years later, left behind those old childhood playthings en route to college in Toy Story 3. 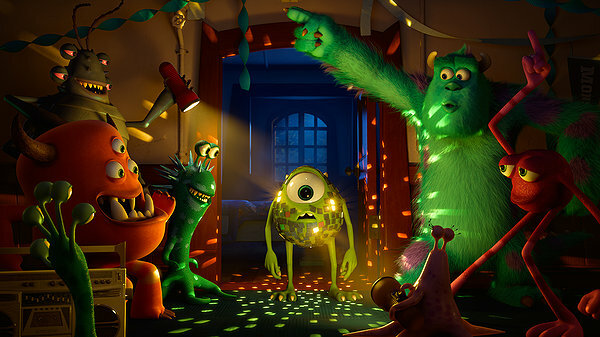 Three years later, that college life is the setting for Monsters University, a prequel to 2001’s Monsters, Inc., where kids saw an imaginary world behind the bedtime fears. Billy Crystal and John Goodman reprise their roles as the younger incarnations of Mike Wazowski and James “Sulley” Sullivan, respectively. The uni-eyed Mike enrolls in the titular college hoping to major in scaring and eventually land a job at Monsters, Inc., “the big leagues.” Sulley, on the other hand, is a lunkheaded child of privilege who gets by on his family name and one go-to fright face. The hard-charging but scareless Mike resents the lazy Sulley, while Sulley dislikes know-it-all Mike. Mishaps eventually thrust the two together as members of Oozma Kappa fraternity (“We’re OK!”), a melange of misfits who are distinct underdogs in the annual Scare Games. Both the games and scaring program are overseen by strict Dean Hardscrabble (Helen Mirren), a Hogwarts-esque headmistress who holds the keys to Mike and Sulley’s futures at MU. The plot is as old as Revenge of the Nerds and as recent as The House Bunny and Pitch Perfect. But in the hands of Pixar, director Dan Scanlon and a terrific cast led by Crystal and Goodman (both with voices born for animation), the threadbare story reaches humorous and enjoyable heights. The film doesn’t approach the level of Pixar’s elite entries—the Toy Story series, The Incredibles, Up, WALL-E, Ratatouille, and even Finding Nemo. But it exudes a sure-handed, polished professionalism that is both entertaining for kids and reassuring for adults. The film also reclaims some of the luster Pixar lost in the wake of Cars 2 and even the ambitious but uneven Brave. Still, the fact that Monsters University is the best animated film this year reveals more about the state of animated filmmaking than the merits of the movie.